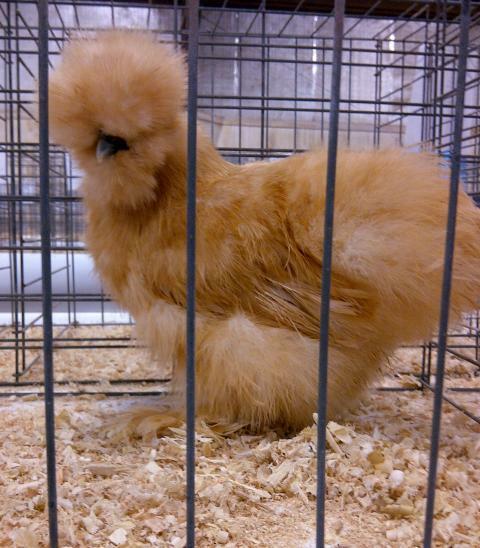 The Boston Poultry Expo located in North Oxford, MA is a great show for all chicken peeps to attend. I had a wonderful time getting to sit and talk to fellow breeders and friends from here on BYC. I think if you live in the New England Area and can make this show you will love it! The fall show is definitely bigger than the spring show but, both are a great time! I love chatting with Pam B., Jimmythechicken, Little Blue, Celtic Hill, Arielle, Lisafromthenorth, and so many others!!!! [B][COLOR=#000080][SIZE=3]This is my little Buff Pullet from Sundown Silkies, She did very well 1st and rec'vd "BV" and I owe it all to Chelsea!!! Thank you Chelsea!!!!!! [I][I][I][I][B][COLOR=#000080][SIZE=3]This is my Blue Cockrel called Mr. Blue Mood. He was shown by Pam B. 's daughter Lexi who does are great job! He took 1st in his class/division. [I][I][I][I][B][COLOR=#000080][SIZE=3]Here's my pair of Juvie Orps Pre-Show Coop-in. My black Orp Brutus hatched Feb 2011 from Renie and this little blue orp is my May hatch from my own stock.